Get the confidence and security of a new car for nearly the price of used when you buy a Certified Pre-Owned vehicle from Crown Chrysler Dodge Jeep RAM of Cleveland. Cost-conscious drivers in Cleveland, Athens, Dayton, East Ridge and Chattanooga, may want to consider a Certified Pre-Owned Chrysler, Dodge, Jeep or RAM over a new vehicle due to price, but also because it has to face a rigorous certification process before it can be declared CPO. This certification process ensures only the finest late model vehicles earn the label. And, when you buy a CPO vehicle from Crown Chrysler Dodge Jeep RAM of Cleveland, you'll also get something few other dealers and manufacturers offer - Lifetime Certified Warranty Upgrades! This added bonus ensures your CPO vehicle will be protected for as long as you own it. 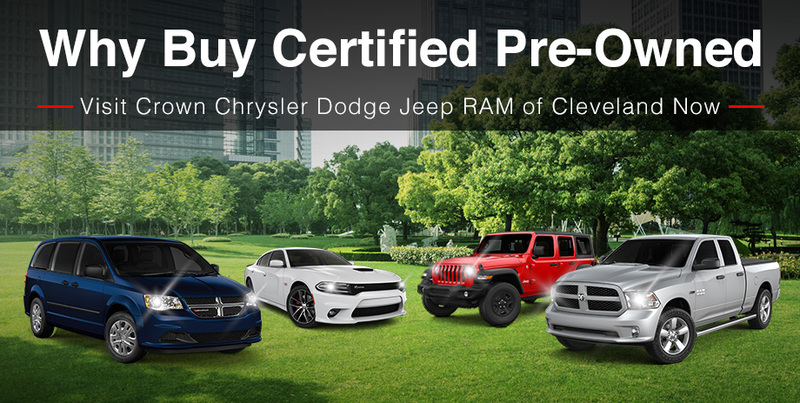 Explore our wide selection of Certified Pre-Owned vehicles when you stop by Crown Chrysler Dodge Jeep RAM of Cleveland. Fill out the form to schedule a test drive, or visit our dealership today.